Does anyone else hate the murals around Melbourne? I hate them when they preach, or when they are out-dated community projects sadly painted by school children or some artist similarly out of their depth with such a large project. Most of these murals are band-aid solutions to ugly architecture. And even when they are painted by a competent artist they really need a “use by” or “best before” date stamp on them. The worst of all these murals is on the Eastern Hill Fire Station. 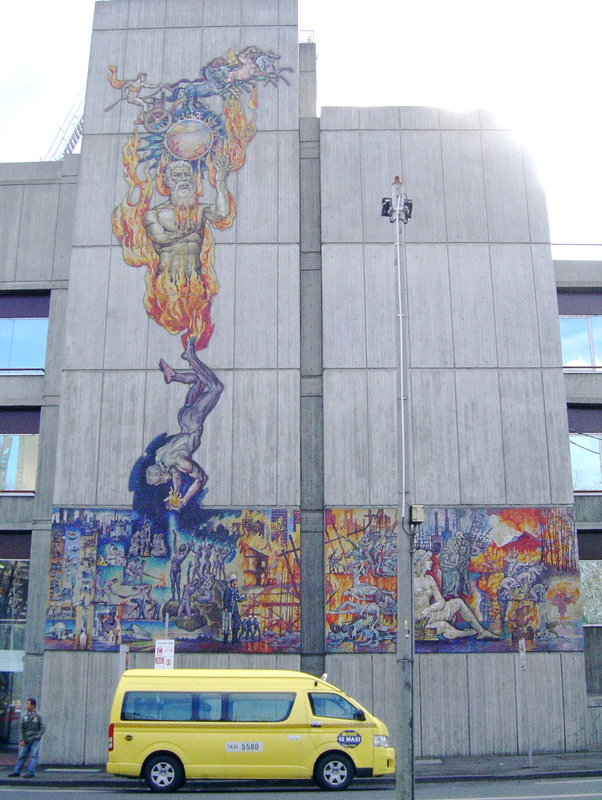 Harold Freedman’s mosaic “The Legend of Fire” 1982 covers one wall of the Eastern Hill Fire Brigade’s headquarters in Albert Street, East Melbourne. This huge mosaic mural is 5 floors high and boasts over one million glass mosaic tiles. The image in a conservative, neo-classical style complete with ancient Greek gods would have looked dated in comic books of the time; Freedman had worked as a cartoonist from 1936 – 1938. Uncertain that this didactic mural would be properly understood there is a large bronze plaque providing a detailed explanation for public edification. It was a huge investment in a work of public art two years after the removal of Ron Robertson-Swann’s sculpture “Vault” from the city square. 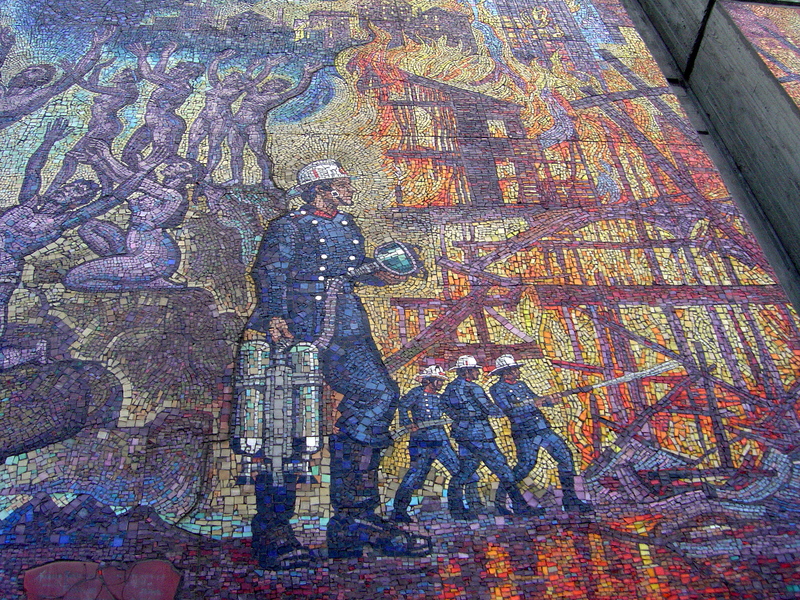 Harold Freedman (1915-1999) specialized in murals depicting the history of a subject like fire for the Fire Station. He painted murals on Australian aviation for the Australian War Memorial, Australian football for Waverly Park, Australian racing for Flemington Racecourse, Melbourne’s transport for the old Spencer Street Station (reinstalled in the new and renamed Southern Cross Station in 2006). Freedman’s enormous history murals incorporated multiple images with a bland illustrative realism that had all the artistry of a textbook, harking to his drawings of procedures for assembling weapons that were used in a training manual in WWII. Freedman’s art is the Australian equivalent of Soviet Realism. The conservative naturalism of Freedman’s murals and their pedantic histories are also an illustration of the conservative and patronizing nature of Australian society at the time. In 1972 Harold was appointed as the “State Artist of Victoria”, a unique position with no previous or subsequent appointments. It was the only such position in Australia history and one he held for eleven years. I’m not sure how this is connected with the Arts Victoria Act that was also passed in 1972. (c. 1940-1947) gouache and watercolour (38.0 x 32.0 cm) presented by the Royal Australian Air Force in 1947 and not currently on exhibition. However, this is also an indication of how unrepresentative the NGV’s collection is of Australian art history. And how the NGV massages and manipulates its exhibition of Australian art to create a false impression of the history. This raises the further question of should the NGV’s collection represent Australian art history or only contain works that “enhance the collection”? This entry was posted on Tuesday, August 9th, 2011 at 2:58 PM	and tagged with Eastern Hill Fire Brigade, Harold Freedman, Melbourne, mosaics, National Gallery of Victoria and posted in Art History. You can follow any responses to this entry through the RSS 2.0 feed. i have fond memories of it from boyhood, but haven’t seen it through adult eyes – surely there’s a place for “the Australian equivalent of Soviet Realism” – i reckon it should stay. A lot of people have fond childhood memories of Freedman’s murals. “Australian Realism” will continue to exist in reality but the artists, like Harold Freedman has been written out of Australian art history. Back in the early 80s, I was taken to the studio of Harold Friedman, the State atist, where he was directing the painting of a mural of Horses through the centuries. I believe it was to be transferred to Flemington racecourse. Can anyone tell me where it can be seen now? Maureen I was Harold’s assistant on the History of thoroughbred racing and it is in the Hill stand at Flemington racecourse.